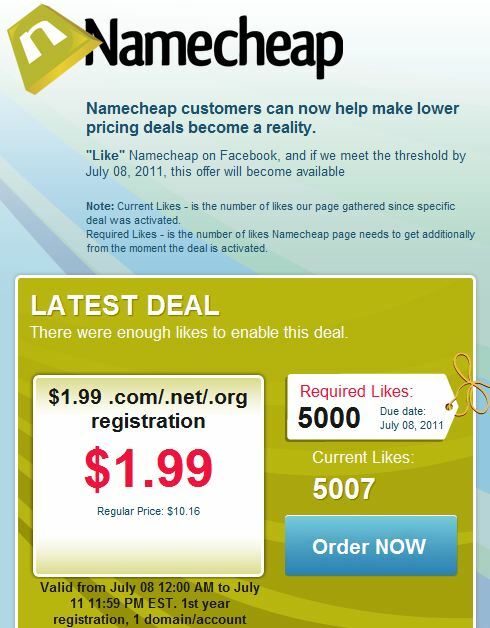 This is a promoting campaign from NameCheap – the customers can now help make lower pricing deals become a reality. Now this campaign met the contest threshold level, so all customer can use the coupon codes to register any .com/.net/.org domain for $1.99 for first year. Really NameCheap is a very good domain registrar, I decided to choose this registrar as my favorite domain holder since 3 years ago; and now I’m managing all domains on NameCheap; because their advantages: low prices for new registrations or domain transfers, very good & better domain managing system, support many payment methods. With the above requirements, I think it’s too easy to get a code, and I also register a .com domain recently, but I still have 3 coupon codes but I can not use. So I make this post to share them for FREE with the lucky readers. 36 hours after this post published, it’ll be 3:00 PM, July 11, 2011 (maybe the contest will end sooner, I can not decide when :D), you can check the time on this page; I’ll random 3 lucky man. Thank you very much for joining our contest. Hope you’ll be one of lucky readers. Same as godaddy offer but looks good. Thanks for sharing. Hello, i need 1 counpons. Can u send it to my email. thanks very much.